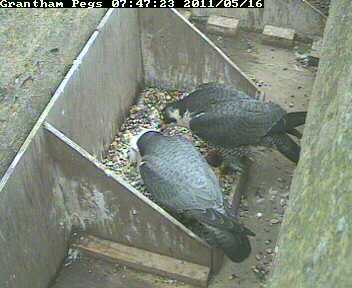 At 07-45 this morning I switched on and saw two adult females feeding the chicks! The plumage colour difference was very obvious when they were side by side but the large size tells us they are both females. The bird furthest from the camera is our regular mother, ringed as a chick in Lancashire in 2006. The one nearest the camera is possibly a chick from two years ago that is "helping out" with the feeding. This is our best guess so far but it does seem unusual!